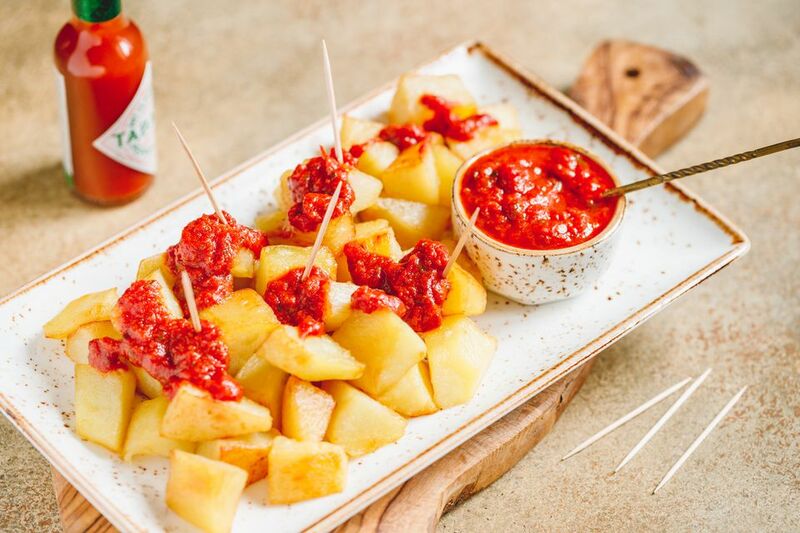 Patatas bravas is one of the most popular and classic Spanish tapas dishes that is served in bars all over Spain. Supposedly, the dish was invented at a bar called Las Bravas in Madrid, though there are many people who beg to differ. The recipes vary throughout the country and even from one tapas bar to another. With all of them, though, the bravas sauce should be a bit spicy—hence the name bravas, which means "fierce" or "courageous" in Spanish. This version of the sauce has a slight bite from Tabasco, which makes it easy to prepare. It's served alongside freshly fried, bite-sized potato chunks that are easy to skewer with a toothpick. Peel the potatoes. Cut each potato lengthwise, then cut it lengthwise again. Cut each of those 4 long pieces crosswise, leaving you with 3 or 4 chunks that are about 1/3- to 1/4-inch. In a wide, deep frying pan with a heavy bottom, pour olive oil so it is about 1-inch deep. Heat the oil on medium-high until hot. To test it, carefully place one piece of potato in the oil. It is hot enough if the potato immediately begins to fry. If there is no bubbling or frying, the oil is not hot enough and the potato will absorb too much oil. Fry the potatoes for about 10 minutes, or until golden brown or browning on the edges (depending on your preference). Use a slotted spoon or a spatula to remove them from the oil and set them aside on paper towels to drain. In a small frying pan, pour 1 to 2 tablespoons olive oil. Heat over medium heat. Pour tomato sauce into the pan and sauté for 5 minutes. Turn the heat down and add the mustard, stirring well. Add the Tabasco, paprika, and vinegar, and mix well. Taste the sauce and adjust as necessary with salt, more Tabasco, etc. Place the potatoes on a plate or in a wide open dish and pour the sauce over the potatoes. Serve warm with toothpicks and enjoy! Potatoes are a staple of Spanish cuisine. When they are fried in olive oil, they're known as patatas fritas and these are served with almost any main course. In its basic form, patatas fritas are simply French fries: Raw slices of salted potatoes fried to create a crispy snack or side. It's when you add the sauces that great tapas like patatas bravas are created. Another tapas that begins with fried potato chunks, rather than slices, is patatas con alioli. Alioli is a garlicky mayonnaise that goes perfectly with hot or cold potatoes. You could serve these as complementary tapas along with patatas bravas and have fun calling the duo patatas bravioli.